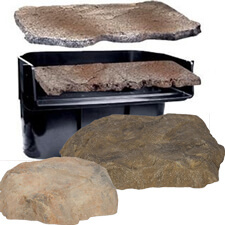 All Skimmer Lids If you're looking to conceal a skimmer, waterfall filter or diffuser, using real stone can sometimes be unmanageable. Utilizing a lightweight fake stone is a better option. Available in a variety of sizes and finishes that fit into any region.